Evgenij Zubko of Far Eastern Federal University (FEFU) in collaboration with other international team members has developed a comprehensive model to explain the results of a photometric study of the Comet Schwassmann-Wachmann 1 (29P). This study was successfully accomplished recently. The findings came as a real surprise revealed that the dust environment of 29P predominantly consists of only one type of material - magnesium-rich silicate particles with presumably a small amount of iron (Fe-Mg silicates). The observation of Comet 29P - the so-called Centaur object - was carried out in the course of the Comet activity when the brightness of the celestial body increases for hundreds of times. This was resulting from sudden and barely understood outburst activity of the comet. The observation results published in Icarus journal. "We analyzed the scattering of light by particles of irregular shape in the inner coma of the 29P. To do so, we performed simultaneous modeling of the color measured in pairs of filters B-R and R-I. The model of light scattering, built on the basis of this computation, helped us to draw a conclusion about the chemical composition of cometary dust. Comparing the value of the imaginary part of refractive index with what is already known from laboratory studies of various analogs of cometary dust, we end up with a very much confident conclusion that the dust environment of this comet is almost one hundred percent is formed of particles consisting of magnesium-rich silicates with a small impurity of iron (Fe). The volume of other possible impurities is extremely minor. What is truly significant it is that this type of material was detected in comets by the space probes. Furthermore, the retrieved size distribution of dust particles in 29P also appears in excellent accordance with in situ studies. Thus, we have drawn a very much self-consistent picture of the Comets." - reported Evgenij Zubko, a lead research scientist at the FEFU School of Natural Sciences. Except for 29P, there is the only sole example of a comet with a single-component dust coma - this is the comet 17P/Holmes. Like 29P, Holmes periodically experiences outbursts presumably as a result of the inner CO and CO2 outgassing. Astronomers have assigned comet 29P to a special class of objects, the so-called "Centaurs". The name of this kind of comets was given by analogy with the mythological creatures. Like centaurs, comets like 29P have a dual nature: being comets, they move in a nearly circular orbit, atypical for comets. Such orbits are usual for large asteroids and planets. The 29P nearly circular orbit does favor its origin from the Kuiper Belt. At the same time, some data also indicate that the comet may origin from the Oort Cloud. This an extremely remote region is located at a distance of almost one hundred thousand astronomical units from the Sun - approximately one light year. Comets that currently settle in the Oort Cloud are believed to have been thrown there in the early stages of the Solar System when it was only forming. They may spend in the Oort Cloud several billion years. Under the effect of various factors, such comets sometimes may return back into the inner part of the Solar System where the Earth is located. Commenting on the importance of comets observation, Evgenij Zubko, emphasizes that comets are among the oldest objects in the Solar System. Some of them get formed when the Sun had not yet become a star, which means they should have very much primordial composition; whereas, billions of years spent by comets in very distant and cold Oort Cloud may help preserve their ancient composition. With comets we get a chance to have a look into the history of our Solar System. Currently, there are several known groups of comets with significantly different properties. Explaining of these differences is aimed to help scientists better understand how the Solar System evolved and which processes took place in it 4-5 billion years ago. 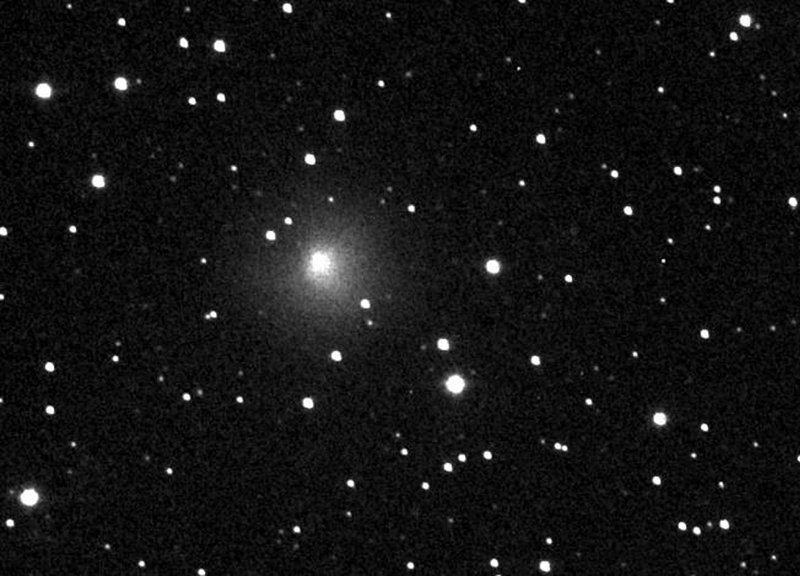 A team of scientists from Russia, Slovakia, Brazil, France, Ukraine, and the United States observed Comet Schwassmann-Wachmann 1 (29P) during one night using the Southern Astrophysical Research (SOAR) Telescope with an aperture (primary mirror diameter) of 4.1 meters, located in Serra Pachon, Chile. Universidade de São Paulo, Instituto de Astronomia, Geofísica e Ciências Atmosféricas, Departamento de Astronomia, Rua do Matão, 1226, Cidade Universitária, São Paulo CEP 05508-900, SP, Brasil. Astronomical Observatory, Taras Shevchenko National University of Kyiv, Observatorna str. 3, Kyiv 04053, Ukraine. Astronomical Institute of the Slovak Academy of Sciences, Tatranská Lomnica, SK-05960, Slovak Republic. Main Astronomical Observatory, National Academy of Sciences of Ukraine, Goloseevo, Kyiv 03680, Ukraine. School of Natural Sciences, Far Eastern Federal University, 8 Sukhanova Street, Vladivostok 690950, Russia. Instituto de Física e Química, Universidade Federal de Itajubá, Av. BPS, 1303, Pinheirinho, Itajubá CEP 37500-903, BRASIL. US Army Research Laboratory, RDRL-CIE-S, 2800 Powder Mill Road, Adelphi MD 20783, USA. Space Science Institute, 4750 Walnut Street, Boulder Suite 205, CO 80301, USA. Department of Astronomy and Astronomical Observatory, Odessa National University, Shevchenko Park, Odessa 65014, Ukraine. GEPI, Observatoire de Paris, PSL Research University, CNRS, Place Jules Janssen, Meudon 92195, France.